What a festival! I guess it may just be because I managed to make it to more sessions than in recent years, but I thought this year’s BAF was one of the finest. The quality of the sessions and the variety of the subjects covered made it a fascinating week. I made it to most of BAF Game for a change, and a few of the main festival down at the Museum. So here are some of my highlights. 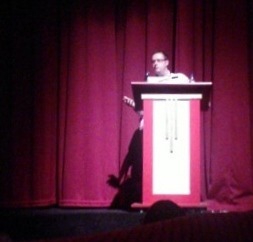 The festival kicked off with Stewart Gilray talking about resurrecting the Oddworld brand. Abe’s Oddysee was one of my all time favourites on the original Playstation. The characterisation was superb and I had real empathy with the character, to the extent of getting very upset when there was a particularly nasty plant that kept eating Abe! The reworking looks superb, and it was pleasing to hear that they were shying away from producing a touchscreen edition for tablets as the control system doesn’t suit. I can understand the desire to produce tablet and phone versions for a lot of classics (not least to make some money, but also as a challenge), but unless you revise some substantial parts of the interface, they just don’t work. Yes, GTA is playable on an iPad, but it’s nowhere near as easy or fun to play as on a console. It was also fun to hear that there were five games in the original vision, each of which added a new character to those of previous games, resulting in five playable in the last one. Let’s hope they all come into existence! 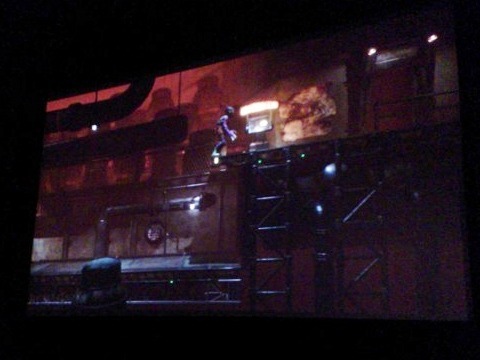 Either way, the re-imagining of Abe’s Oddysee, Nice ‘n’ Tasty, looks ace. Jennifer Schneidereit and Philip Tossell from Nyamyam talked about Tengami, a beautiful Japanese-inspired game that has its game mechanic based on the ‘pop-up’ book. This has some really original ideas in what was basically a platform/adventure cross-over, and the design tools that they demonstrated showed some creative problem solving to get this game into a playable state. Whilst the game looked great, and the playable sections they showed were great, I guess my question is longevity. How do you keep up the wonder of the the initial ‘page-turn’ with the pop-up mechanic, and how do you keep it from becoming repetitive? It’s clearly aimed at touchscreen devices, and games for these tend to be a bit more cerebral than action-based, so I’m sure it will find a market, but I’d want to play more before handing over my cash I think. The ‘pop-up’ book metaphor continued into the next talk from Joel Smith from Sony. 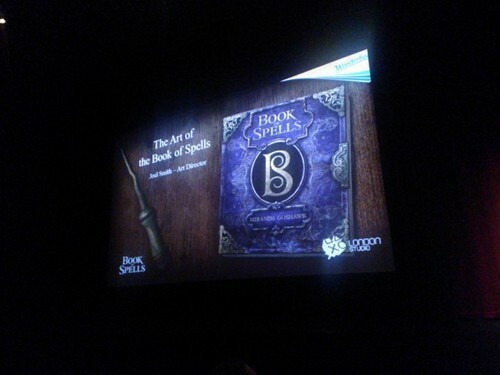 He talked about the harry Potter Book of Spells game that uses the Sony Eye and Wonderbook to create an augmented reality game that changes the ‘Wonderbook’ into the Book of Spells from the Harry Potter stories. Players then take on the role of apprentice wizards and use the Move controllers as wands to cast spells, etc. This looked like a great deal of fun, I just need to find an excuse to get this as I’m not exactly in the target age group! It will be interesting to see how well the interface works, the children in the demo that they showed seemed to be engaged with it, but I guess they wouldn’t be shown otherwise.